I looked up a bunch of recipes and just sort of mashed ideas together to make this. 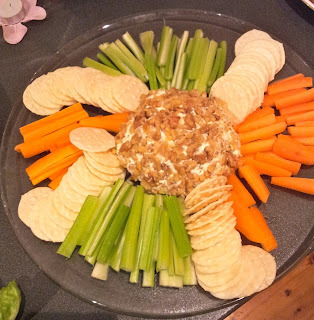 A lot of cheese balls had gherkins and things in them but my sister in law has allergies so this one doesn't have them. Mix everything except the nuts together. It got kind of runny, so I ended up trying to form a ball with it, placing it in glad wrap and putting it in the fridge to firm up a little before I put the nuts on. One it was kind of firm I pressed the crushed walnuts on and placed it on the plate. I served it with celery and carrot sticks plus gluten free crackers. It was surprisingly good! You could add more Tabasco sauce if you want it spicier, but I knew I liked things spicier than my guests, so only did it mild.